Description: Looking S with dwarf signal as shoefly joins original trackage. Museum on left. Rebuilt overpass on right. Description: Built by Baldwin in 1938. Description: One heck of a display of Santa Fe Passenger Power on display at the Great Plains Transportation Museum. Description: This RCO Job rolled past Wichita Union Station and the Great Plains Transportation Museum on the way down by Wichita Jct. to switch out some industries. 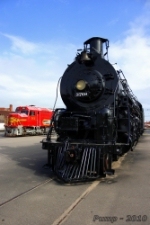 Description: The magnificent loco is on display at the Great Plains Transportation Museum. 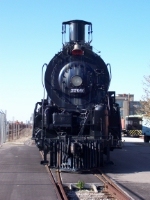 Description: ATSF 3768 is seen on display at the Great Plains Transportation Museum. Description: On display at the Great Plains Transportation Museum.